Tonight, Friday March 6 from 5 – 9 p.m. is a reception of Elaine Penner’s artwork “Nature Unleashed” at Artbeat Studio. The Exhibition runs from March 6 – 28th. For exhibition poster and hours visit http://artbeatstudio.ca/nature-unleashed/. Friday March 13th Studio Central will be having a St. Patrick’s Day House Concert. Please make sure to catch Quintin Bart and D’Arcy Stearns for Irish Traditional music. Darcy Kerr’s art is currently on display until the second week of March in the Alumni Gallery. Artbeat Alumnus Kathleen Crosby’s work is on display at the Millennium Library. You can find Kathleen’s paintings in the library on the second floor. On Tuesday March 10th please watch for ten additional poems released for Kaleidoscope Online (ten on the tenth) – http://artbeatstudio.ca/kaleidoscope-online/. 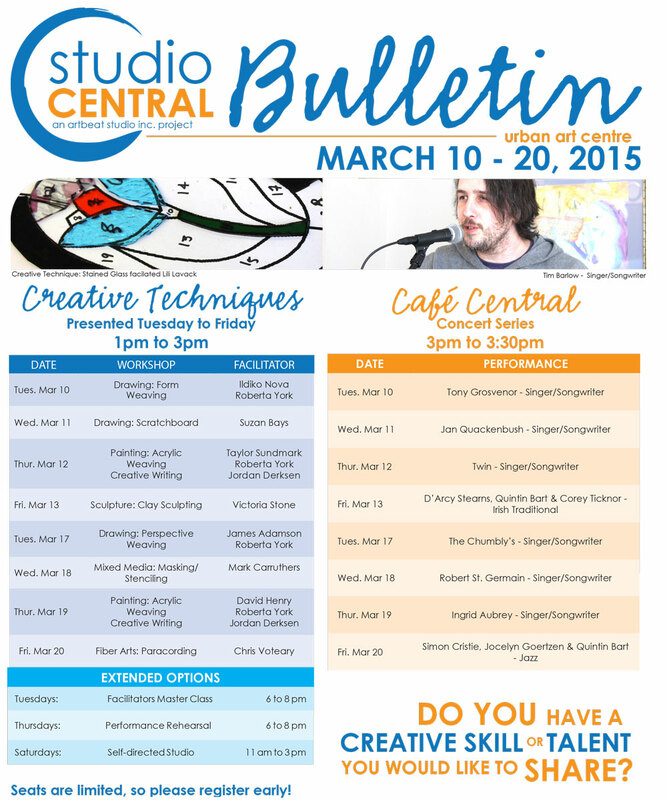 Join us at Studio Central – our day programs, Facilitator’s Master Class, Thursday Performance Rehearsal and Self Directed Studio are in full swing. Please call 204 -943-8290 to register. We look forward to seeing you!